TNT Maniac is a minigame involving explosions and kits. It’s similar to that of Mineplex’s Bomb Lobbers where the main objective is to eliminate the other team. TNT Maniac is suitable for any amount of players and before starting each player will be able to select among one of three classes. Right now there’s just one arena (Pirate Ship) but more will be added in a future update. Before actually going anywhere it’s recommended that you read the rules and guidelines in the game lobby. Once that’s done then you can enter the game and select a class. To select a team simply step on the red or blue block. As soon as everyone have entered the game it’s time to let the game begin. The main objective is to destroy the other team’s base and eliminate all of the enemies. TNT RUN is a fairly common minigame but this time things are a little bit different. There are two different teams. This means that you should (preferably) work as a team to destroy the other team’s contestants. But even after you’ve done so there won’t really be no way to win other than waiting for everyone else to have fallen down. Set up guidelines as you may see fit. The spawn is inside a small lobby. Press the start button as soon as everyone have entered the world to start it. Before actually spawning on the TNT Run platform you’ll have to select a team (blue or red). The gameplay is kind of self-explanatory. Run for your life, or die! You can reset the TNT Run platform by pressing the Reset button. Beware, it may cause some temporary lag! This is a snowball war minigame for single player. You will be control over a character who you must defend against incoming snowballs. You must also make sure that neither of the incoming enemies invade your base. It’s a really fun and clever minigame which makes great use of both redstone and command blocks to enable really cool features. You’re equipped with a snowball thrower which you can use to throw snowballs at the opponents coming toward you. Simultaneously you will be controlling a character underneath your feet. You always have to make sure that he’s always safe and never hit by any incoming snowballs or else you will lose. It’s also important that you don’t let any of the opponents get past your character. If too many of the opponent team does then it’ll be game over and you have to start over. Winning rounds will earn you emeralds which you can use for buying new upgrades in the store (Tienda). 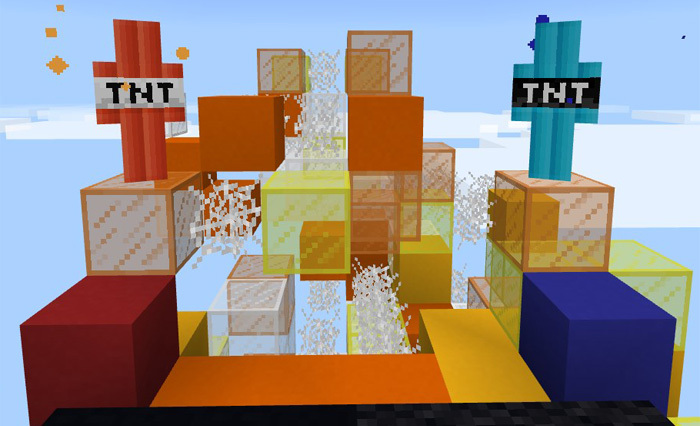 TNT Run is a fun minigame which can either be played in single player or as a group in multiplayer. Either way, it’s a very intense minigame which takes place on a big platform made out of pressure plates, sand blocks and TNTs. Players have to run around on the platform to avoid falling down. The last person standing is the winner. Press the Start button in the game lobby to start the minigame. Everyone will spawn in a glass box which is situated just above the TNT Run platform. A countdown will be initiated and then everyone will teleport to the platform. As soon as you’ve dropped down and spawned there it is time to start moving! The blocks will fall down into the void underneath you and it’s your objective to stay alive as long as possible without falling. After a round of playing most of the platform will be destroyed. It is automatically reset as soon as a new game is started. Get some friends together and challenge them in an awesome wool race. It’s a competitive map which is best suitable for 2 – 4 players. 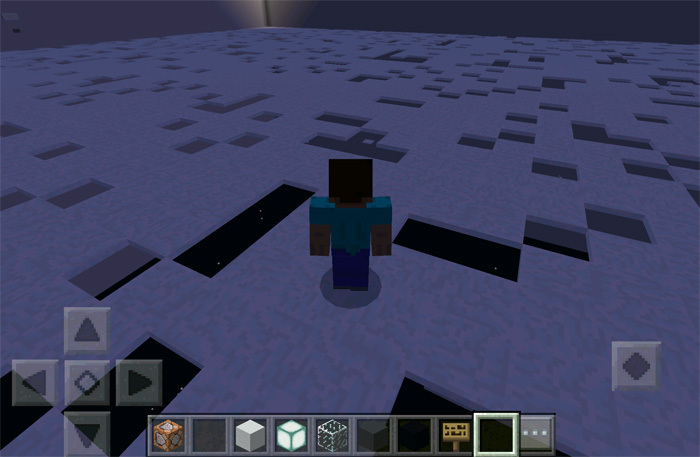 Players must search tens of different chests to find their wool color and then fill them in a path of empty blocks. The first player to fill in their entire path is the winner. Even though it’s a quite basic minigame it’s really a whole lot of fun. There are detailed instructions in-game. However, it’s a quite basic game so it shouldn’t be any difficult getting started. Each player must choose and color and then they must fill a path with that color. The person who fills their entire path first is the winner. There are three different game modes and they include easy, board game to an extreme free for all. This is a minigame which takes place in an ancient jungle temple. There are several small challenges and plentiful of deadly traps which you have to complete in order to escape. 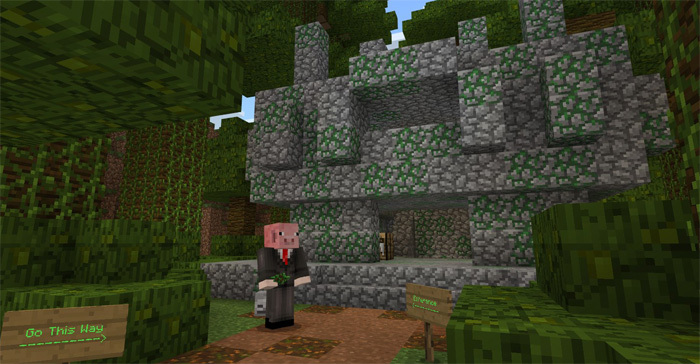 Most of the dangers (such as traps) are automated by redstone and command blocks. The overall result is an intense and fun minigame which works really good for speedruns. The main objective is simply to complete the challenges and find a way to get out of there alive. If you want to, you can choose to collect the emeralds. There are five emeralds in total. The map is meant as a map to quickly speed through. Start a timer before heading into the temple and see if you can beat your (or a friend’s) record. The game starts as soon as you step on the emeralds. Get ready for some bobsledding in Minecraft! This is a racing map in which you will preferably compete against other players in a race on ice. You’re vehicle will be an ordinary boat which when placed on ice will slide and the real pros will be able to reach incredible speeds! This game is suited for anywhere between 2-5 players. It’s not your ordinary type of boat race. The main difference is that you will be traveling on ice! And as a result, you will be able to reach much higher speeds than ever possible in the water. The main objective is to be the one to first reach the finish line and place down your wool block. It’s a quite long track with several curves and obstacles. This minigame is based on the classic arcade game by the name of Donkey Kong. It’s a platform game where the player needs to jump over obstacles to get to the top and rescue Pauline from Donkey Kong. It’s a really well made minigame with some neat features to make it well worth playing. Press to button in the lobby to start the game. Jump over the minecarts which continuously come driving down the rails. The objective is to reach the top platform and press a button to complete the game. If you get hit by one you’ll die immediately and have to start over. SnowFall is a cool (and cold) minigame to play with friends. It’s kind of similar to spleef, but in this minigame the floor will fall by itself at random! You will never know which block beneath you is about to fall and when you know it’s usually too late anyways. It’s a really fun and intense minigame best enjoyed in multiplayer. Blocks of the floor randomly disappears every second so you have to constantly be on your move in order to not fall down and die. The main objective is the stay alive for as long as possible. If you die then you are not allowed to enter until a new round has begun. Eventually most of the map will be just holes. This is when it starts getting exciting and more intense. Never stay idle. Always move around or else you’ll most likely fall down and lose!